Beyond Knit and Purl by Kate Atherley, Cooperative Press, 2011, 130pp. First off, a disclaimer: I tech edited Kate’s book, so I’m absolutely, 100% biased — and pleased as punch that I was able to be a part of this fantastic book. Reading Kate’s book is like having an incredibly talented personal knitting teacher with infinite patience at your beck & call — offering guidance on topics you’d expect, but also teaching you things you didn’t know that you DO need to know. Kate first walks you through things generally not taught, such as how to choose and evaluate a pattern (the first chapter of the book). At the end of the chapter she includes a cheat sheet outlining stitch patterns, skills required, and difficulty level. She also has a neat little table with columns entitled “Successfully Knitted?” and “A Good Next Step” — perfect when you don’t really know what to do next! Another table is organized by items, skills required, and difficulty level. In the second chapter, Prepping for Success, she touches on size, gauge, yarn selection and more. 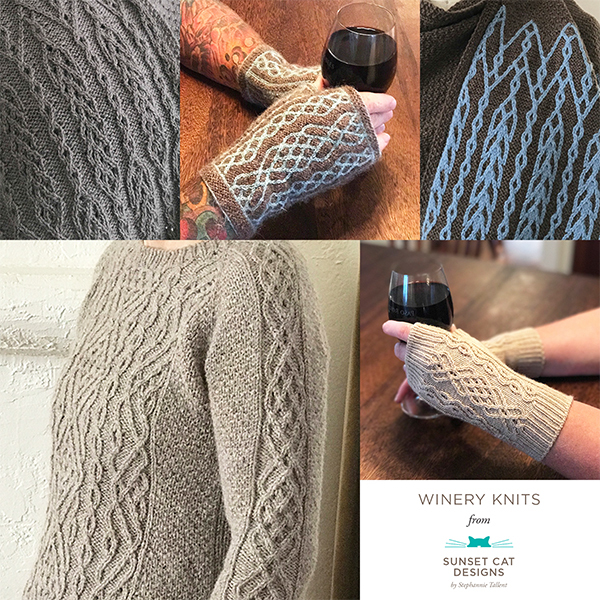 Chapter 3, Working from a Pattern, is just that: how to read & use your chosen pattern, including an overview of the language of knitting patterns. This is another topic I’ve not seen taught — I know I had to pick it up on my own. Chapter 4, What Patterns Don’t Tell You, and Chapter 5, Other Frequently Asked Questions, include a variety of tips & other information (how to join a new ball of yarn, the difference between Continental & English knitting, and so on). The remainder of the chapters are technique based, with associated projects with which to practice the technique. Topics include shaping, working in the round, socks (cuff down & toe up), cables, lace and colorwork. Each chapter exhaustively explores its topic. Patterns range from a top-down triangle shawl in the shaping chapter to my favorite, the Houndstooth socks in the colorwork chapter. I don’t want to leave you with the idea that this book is just for beginners — it’s not. The colorwork chapter, for example, starts with stripes, but goes on to cover stranding & intarsia, topics not considered beginner. Kate’s packed so much information in here that (unless you’re Kate, and already know all this, lol) I’d be surprised if you didn’t learn something new, or have something clarified. If you’re a designer or a teacher, it’s also useful to be reminded about the issues newer knitters do have. 4/12/2012 Marnie Speak! Good Girl. Next post: Scrumptious Knits Winner! Previous post: California Revival Knits now available in PDF!